Ylang ylang (Cananga odorata) essential oil comes from flower petals of the large, tropical ylang ylang tree. Ylang ylang actually means “flower of flowers” and was given this name because of its sweet, floral scent. In fact, ylang ylang oil is one of the key ingredients used in the legendary perfume Chanel No. 5! It’s been highly sought after for centuries for its natural thickening effect on hair and also its healing properties on the skin. Throughout history in Indonesia, and even today, it’s commonly been used to decorate the bed of newlyweds on their wedding night due to its energizing, aphrodisiac qualities. Today, ylang ylang trees are widely grown in tropical areas throughout Asia, including Indonesia, the Philippines and the Polynesian islands. An interesting fact is that the quality of ylang ylang oil depends a lot on the cultivation of the flowers that are used — specifically the time of day that the flowers were picked. It’s believed that flowers picked early in the morning yield the most beneficial oil, since the flowers are pollinated by night moths. The drop in temperature and dewiness that can occur overnight might also have positive effects on the oil’s chemical structure. The most intensive smell is released from dusk until dawn so when sunrise comes, the flowers’ natural aroma fills the air. As the distillation process is repeated, lower-grade oil is produced. This is the type usually just called “ylang ylang oil” or “cananga oil” that’s used in most fragrant soaps and cleaning product manufacturing. 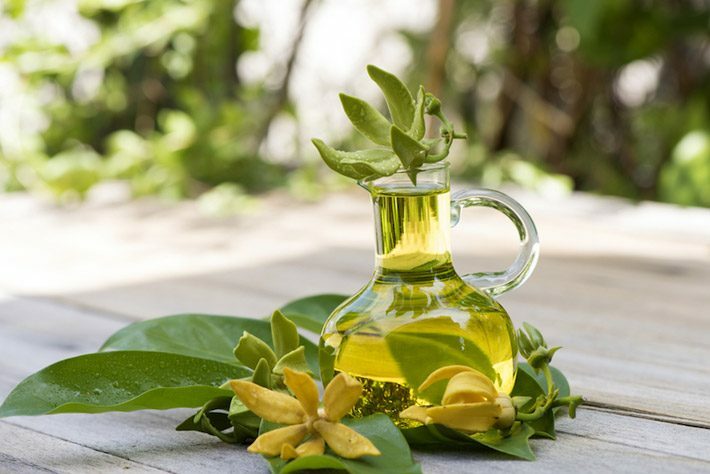 Studies show that high-quality ylang ylang oil holds a high percentage of active constituents called terpenoids. 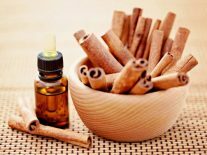 Isolated terpenoid derivatives (including canangaterpenes IV-VI) show promising results as natural therapeutic agents for the treatment of several skin disorders. When tested on cancerous melanoma skin cells, terpenoid compounds exhibit a potent inhibitory effect on cell melanogenesis and immune-system cytotoxicity. In other words, antioxidants in ylang ylang oil help protect skin cells from oxidative stress and DNA damage that can lead to cancer cell formation. 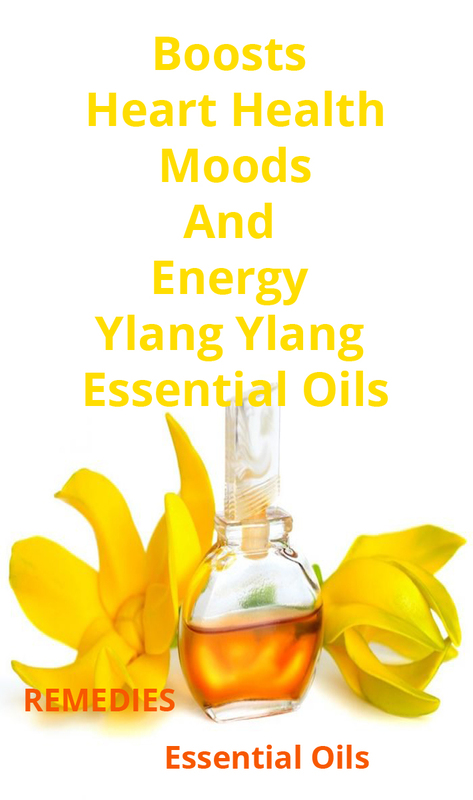 Other active compounds in ylang ylang oil include several types of flavonoids, terpenes, o-methylmoschatoline, liriodenine and dihydroxybenzoic acid. The pleasant fragrance of ylang ylang varieties is mainly due to these volatile organic compounds produced by the flowers. According to a 2014 report published in the Journal of Experimental Botany, the floral scents of ylang ylang are a key factor in plant-insect interactionsand are vital for successful pollination since they repel pests and bugs. Researchers from the Phytochemistry Research Department at the University of Rajshahi in Bangladesh found that these phytochemicals also possess antibacterial, antifungal and cytotoxic activities when used topically or internally by humans. They can help improve immune function and lower inflammation, which is a leading contributor to most diseases, such as cancer, heart disease, autoimmune and cognitive-related disorders. Yet another benefit of ylang ylang essential oil’s active ingredients is the ability to help prevent nerve damage that can contribute to complications seen in diabetes patients. Terpenoids and flavonoids in ylang ylang have been shown to act like aldose reductase inhibitors, according to a 2014 report published in the Journal of Natural Medicines. Aldose reductase inhibitors have been studied recently as a way to prevent eye and nerve damage in people with diabetes. Aromatically: The oil can be diffused throughout your home using a diffuser or inhaled directly from the bottle. Topically: Ylang ylang should be diluted with a carrier oil like coconut oil in a 1:1 ratio before applying it to your skin. Always test for skin sensitivity before using it on large or sensitive areas of the skin. You can perform a skin patch test on your arm or feet to make sure you don’t experience skin sensitization. Also keep the oil out of your eyes, ears or nose and away from pets that might react to it badly. Internally: ONLY recommended for very high-quality oil brands. Check ingredients carefully, and look for only Cananga odorata (ylang ylang) flower oil. 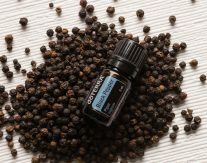 Only use 100 percent pure, therapeutic-grade essential oil if you plan to add a drop to water or take it as dietary supplement mixing with honey or a smoothie. It’s recognized as safe by the FDA (21CFR182.20) when using small amounts internally in this way, but a therapeutic-grade oil might be hard to find due to labeling and marketing constraints if you’re not careful. Purchasing ylang ylang complete or extra is your safest best. This homemade body lotion recipe brings hydration and essential vitamins and nutrients to the skin. In addition, the essential oils tone, lift, heal and protect the skin. Put olive oil, coconut oil, beeswax and shea butter in glass bowl, and then place that bowl in saucepan with water. Heat stove to medium, and mix ingredients together. Once mixed, put in refrigerator for an hour until solid. With a regular mixer or hand mixer, beat the mixture until it is whipped and fluffy. Then add essential oils and vitamin E and mix. Fill container and store in cool place. Use ylang ylang sparingly whether internally or topically. High levels might cause reactions and sensitives, so be sure to do a skin patch check first before using on your face, skin or ingesting. You also want to use caution when dealing with low blood pressure. If you take blood pressure medications or have an existing heart condition, talk to your doctor before beginning treatment with any new herbal remedies. Ylang ylang oil seems safe for children, women who are breastfeeding and pregnant women in small amounts when a high-quality oil is used. It also appears to be safe when applied to the skin, mouth and scalp in combination with other herbal essential oils. There isn’t enough information to know if ylang ylang oil taken by mouth in amounts higher than what is typically advised causes serious reactions, so for now always stick to a small dose.